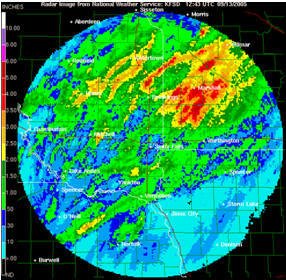 January 23, 2012 - The next generation of the National Weather Services' (NWS) Advanced Weather Interactive Processing System (AWIPS), which was developed, tested and fielded by Raytheon Company, is now operational at the NWS Omaha Weather Forecast Office. As the first of 135 forecast sites to upgrade to the new system, this successful implementation initiates the nationwide roll-out of AWIPS II. AWIPS II, which is represented in Raytheon's participation at the American Meteorological Society annual meeting opening today, plays a critical role in the ability of NWS forecasters to make more precise weather, water and climate predictions, and to dispense rapid, highly reliable warnings and advisories that save lives and safeguard property. "We expect that the AWIPS II software architecture will allow the National Weather Service to reduce information technology sustainment costs and allow greater interoperability and collaboration with neighboring forecast offices, emergency managers and inter-agency partners before, during and after disasters strike," said Don Berchoff, director of the NWS Office of Science and Technology. "There are also plans to leverage the software architecture to develop more robust data manipulation, mining and fusion capabilities vital to increasing advanced notice of high-impact weather events such tornadoes, flooding and winter storms." - Scalability from laptops to servers. "Its open, service-oriented architecture will allow the National Weather Service to be more responsive to requirements for future weather products and services," said Ron Stefano, vice president of Mission Operations Solutions for Raytheon's Intelligence and Information Systems business. AWIPS II will also give users outside the weather community, such as interdisciplinary labs, the ability to more easily ingest, process and visualize essential environmental data to support critical mission needs. Oliver VTOL To Build Commercial Version Of The "Hexplane"
Government Withholds Information, Who Is Flying Unmanned Aircraft In The U.S.? Black Pilots, The Tuskegee Airmen Shattered The Myth In The Movie ?Red Tails?